February 2009 | To Be, To Be. Tutubi. I made a new blog called Building My Dream House where I will share my journey into trying to find a way to realize that dream. There is a reason why this is a dream and not a project and maybe I will write about it later on. If you have tips and suggestions on how to find the resources to build my dream house, please feel free to leave a comment over there. Ang mga puting rosas na ito ang bigay ng aking mahal na kabiyak nuong nakaraang araw ng mga puso. Paborito ko kasi ang puting rosas at ako ay natuwa na paggising ko ay katabi ko na ang lumpon ng mga bulaklak. Kahit na hindi kagandahan ang pagkuha ko ng larawan, ang ligayang hatid ng bulaklak na ito sa akin ay walang pagidlan kaya't ito ay aking ibinabahagi sa inyo. 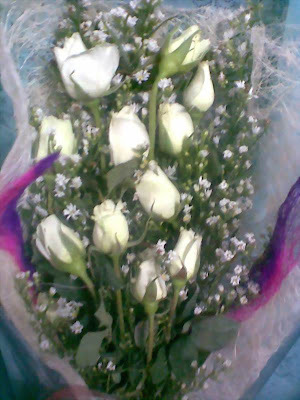 (These white roses were given to me by my dear husband last Valentine's Day. White roses are my favorite and I was delighted to wake up with the bouquet by my side. Excuse the quality of the photograph, but I would like to share nonetheless, the joy these flowers brought me). Check out more beautiful photos at Litratong Pinoy. 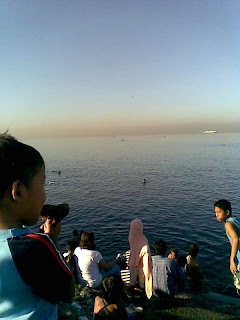 We went to Luneta Park last Sunday for some fun and sun and of course had to stop by the Manila Bay to smell some sea water. They say its good for the kids, and seeing that all three had cough, colds and fever, we thought the air would do them some good. I thought wrong. I was so disappointed at the sight I saw! 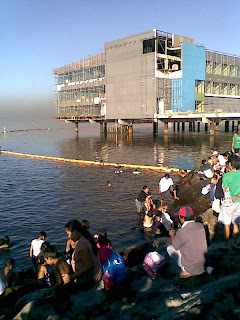 There were people swimming at the dirty, brackish Manila Bay water! And garbage was strewn all over the place. 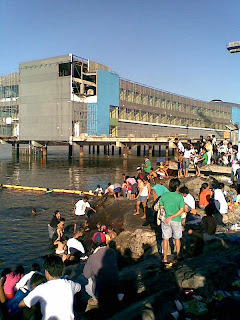 This area is near the Manila Ocean Park where a construction is still on going. I even saw babies being bathed in the dirty water and I was shaking my head in disappointment at the parents who should know better. Oh well. I really don't know what to say anymore. Do you sometimes visit blogs when you are at the office and sometimes feel guilty because you are using company resources? Do you sometimes feel scared that you might bring a virus to your pc or worse, that your IP address might be hacked? If you are renting at a computer shop, are your files free from external attack? Or should you just stick to using your own computer and internet at the safety of your home? I wonder if vpn really does work? I am a newbie blogger and I am really still wading through the murky waters of the internet, so to speak, and I know that all the help I could get with regards to security is most welcome. 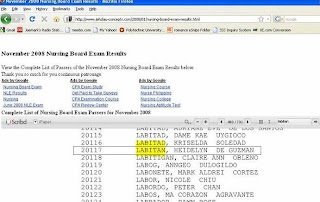 ... And my cousin and kinakapatid passed! Congratulations Lenlen! You are the first Nurse in the family and we are all very proud of your achievement. For more of the results and to check if your friends or relatives passed, visit Jehzlau's blog. I got the above screenshot from there. Kapag may asawa ka na, hindi na minsan practical ang pagde-deyt. Kasi habang kumakain kayo sa labas o nanood ng sine, hindi mo maiwasan maisip , ano kaya ang kinakain ng mga bata, nagawa na kaya nila ang assignment nila o kaya ay baka hindi pa natutulog ang mga iyon sa kahihintay sa amin. Hay, ganun talaga pag may pamilya na. Hindi na sa inyong dalawa na lamang umiikot ang mundo mo. Kaya kalimitan, ang aming mga tipanan ay pang-pamilya. 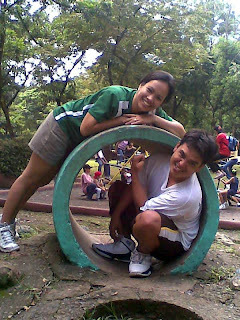 Ang aming paboritong pasyalan ay ang QC Circle, isinasabay na namin ang pag eehersisyo, pagkain sa labas at family bonding. 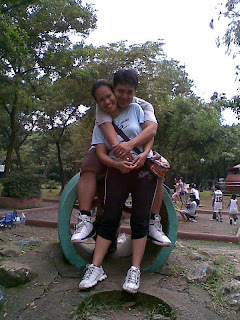 Pero kahit na lakad pampamilya, nakakasingit pa din kami ng aming sweet moments, hindi ba? Madami pang magagandang larawan sa Litratong Pinoy. 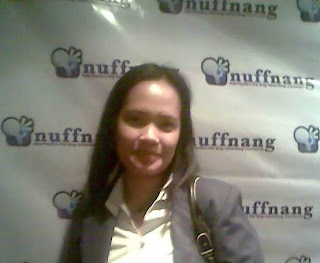 This is my first ever Nuffnang Contest and my entry was one of the Top 20. The awarding was last night and I only learned about this yesterday morning, and I was of course already at the office, in uniform (bleh!) I decided to tell my boss that I will go home early to get this prize and even get a ribbing that yeah, I would win this contest because he knows I am a shopaholic (heh!). My husband came with me and I told him that if I didn't win any ticket, I will still treat him to a movie and dinner, as my late Valentine's treat for him. This is my first time to attend such an event so I was so shy and cant even mingle with my fellow bloggers. I even told my husband to take my picture later when everybody has left, he he. We were sitting right across Dementia but I don't think I made any serious effort to talk to her. So sorry. Will do better next time. I am really no good at small talk. But I think I managed a few words with Kcee. But we enjoyed the event nonetheless, stage fright (?) notwithstanding. Frances won the Gucci bag by the way. We also enjoyed the movie and recommend you watch it showing tomorrow, Feb 18. Here are some pictures of the event, courtesy of Azrael. More pictures from his multiply as well. 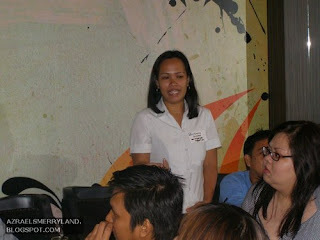 Again thanks to Jing of Nuffnang, fellow bloggers and new friends! I used to wear eyeglasses and contact lens. I got tired of the tedious job of putting on and taking off contact lenses so I stuck to the wearing eyeglasses more. But when the one I was using was broken, I didn't immediately bought new ones. I felt that the one I had wasn't exactly worth the amount I paid for it. See, even when buying eyeglasses, I still consider that I should get the best value for my hard-earned money. I want chic, stylish and comfortable glasses that will not put a big dent on my pockets. Some people I know don't visit eye doctors for check up because they feel that once they are told they need to wear glasses, they are required to buy right there and then. I, on the other hand, don't feel the same way. I know that it is my right to choose the glasses I want, with the budget I have and to buy them where I will get my money's worth. Therefore, Zenni Optical then is the logical choice for me. No less than The New York Times in their article entitled "Patient Money-Seeing Straight Without Breaking The Bank" recommended Zenni Optical for eyeglasses and frames at prices starting at $8! Even in the Philippines, that's a definite steal considering that the lowest priced glasses I can find here are at P1,000.00 for ordinary ones. Zenni Optical glasses on the other hand comes with free anti-scratch coating, UV protection and lens edge polishing and beveling! Best deal ever, don't you think? According their website, they are able to sell their stylish prescription glasses at low prices because they sell direct from manufacturers and do not spend unnecessarily on advertising. Now, that's a brilliant idea! I browsed their site and I found this one which I really, really like. It has rimless, stainless steel frame. It is definitely chic, stylish and reasonably priced! Other available frame colors are silver, brown, gold, pink and black. Of course, there are other products to choose from depending on your specific eye needs and budget. But I think I will get one these one from Zenni Optical for myself. I Am A Certified Shopaholic! Or, er, my entry to My Shopaholic Confessions was chosen as one of the best 20 entries! I will know later tonight what prize I will get but this is just so exciting! 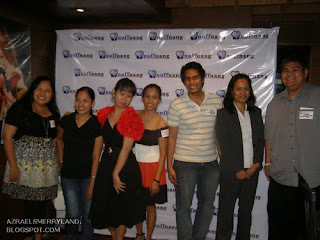 This is the first ever Nuffnang contest I joined and I could already be one of the winners. I feel that I don't stand a chance at winning that Gucci Bag because the other entries are just so nice, but hey I can still dream right? I am so excited for tonight! Yehey! And congrats to all other winning entries! This is one of my all-time favorite songs by Rey Valera. I first heard this in college and liked it even back then. Now, even my kids love this song because I sing this to them as a lullaby. I even have a recording of this song on my phone, so that they can just play it when they want to hear it. If only I know how to upload it here! I just love the simplicity of the lyrics, and emotion conveyed by the song and I am sure lots of people can relate. Here is the lyrics and I added the Imeem widget here somewhere. Enjoy and Have a Happy Valentines! I wrote here earlier that I plan to cook Sarciadong Isda for my husband on Valentine's Day but it seems my mother had other plans. She does the marketing at the house and I think when I told her in passing that we should have sarciado now that tomatoes are cheap, she thought that's what I want for "baon." So excuse my lame attempt at documenting this. If you are a fan of Ms. Connie, you will know how trying hard I feel posting this here. He he. 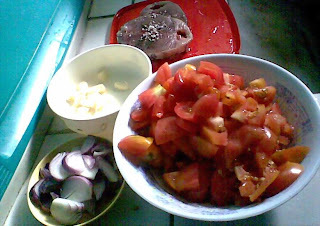 Then saute the garlic, the onions and the tomatoes and season ( I just add a pack of Magic Ginisa Mix). 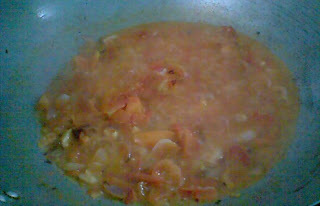 Once the tomatoes are cooked, put the fried fish, stir (haluin?) 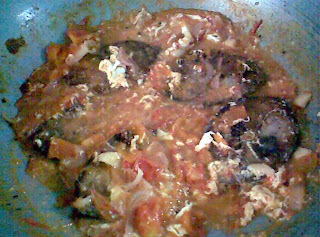 once and add the beaten eggs. Stir once and turn off the fire. And voila! You're done! Here's how it looks like in our lunch boxes. Not very appetizing, I know. Must be the crappy cellphone camera!Lol! I was so pleased at myself for preparing this meal I completely forgot to attach the "I love You " post it note to my husband's lunch! Oh well, there is always next time. Now that we don't have a car anymore, we sometimes go to work on our trusty motorcycle. My husband is a very conscientious driver and knows the road like the back of his hand. So watching the morning news lately and seeing those motorcycle accidents happening everyday, I can just imagine what I will do If I become a victim of a similar personal injury, especially by those SUV owners who think they own the road! I will immediately look for personal injury lawyers like Sweeney, Sweeney & Sweeney and sue them to legally recover from the loss. Too bad Temecula Personal Injury Lawyer is in California. I hope we have the same recourse here and not be just another road statistic. My husband with the Kiddos in Virgin Island, Bohol. realized that I haven't shared what I and the kids could do for their father that day. So here are just some of my ideas of what would probably make my husband happy. 1. Serve him his favorite breakfast. Valentine's day falls on a Saturday and hubby has to work. So for his breakfast, I will prepare him his favorite Pansit and Pandesal with coffee. To make it more special, we could serve it in bed and have a special bonding time. 2. Prepare his favorite lunch. 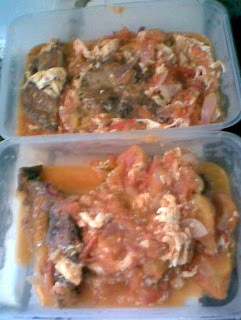 One of my husband's favorite dish is Sarciadong Isda and I can easily make this for him because tomatoes are really cheap now, he he. We can put post-it notes with I love you's to his lunchbox and surprise him. 3. Prepare his favorite dinner. Its a toss between Dinuguan and Batchoy and I am not yet sure if i should prepare this because he will surely eat a lot! Have you noticed that all of the above are about food? Well, they say the surest way to a man's heart is through his stomach, so why not? 4. Give him a massage or a foot spa. We have a home-spa kit and I can easily do this once he is rested. My little girl of 4 gives a mean back massage (where she stands on your back and walks all over!) while the boys can take out his white hair or massage his head or something. He he. 5. Give him the TV remote control. The kids always have the last say on what we should watch at night (except for news). So for a change, tell the kids that Daddy can choose what he wants to watch and we should enjoy it with him. Since its Sunday the following day, we can all stay up late and watch a movie of his choice. I just hope he wont ask us to watch Manny Pacquiao's latest boxing bouts! 7. Give him tickets to a basketball game. 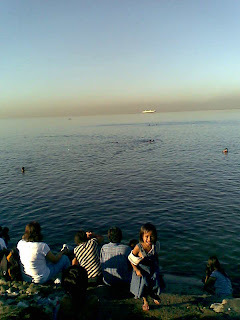 Just too bad that the PBA games will end this Wednesday. He would definitely love to watch the game live. The above examples are just some things that are very easy to do since we do most of them them daily anyway. But what makes it special is we will make him feel extra loved on that day. My dear husband is very easy to please and the kids will surely enjoy making their father's Valentine's Day extra special. We recently sold our car. Its a 10-year old car we bought second hand. As we all know, even well-cared for vehicles are subject to normal wear and tear and this 10-year old car is no different. Though we regularly use it to go to Batangas (my hometown) for occasions and have never had trouble with it on the road, the reality is we have to let it go and let the next owner worry about repairs and maintenance. I really loved that car because my husband was kind enough to teach me to drive it, and the car was durable enough to handle my well, amateurish driving. I even nicknamed it "Pogi" or handsome because it was very well set-up and the mag wheels were so pretty buyers were offering for them separately! Like duh, what would I do with a car without those? It would only lower the selling price! As a consolation, I would like to think that we are contributing a lot to saving this Earth by emitting less carbon, ha ha. We now ride on public transportation and sometimes on our motorcycle. We have no immediate plans of buying another car but when we do, I hope we can get something like BYD Cars. 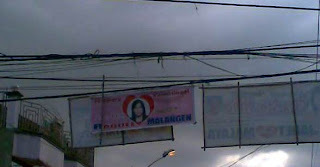 If only electricity cost in the Philippines is not that prohibitive! My name is Dinah and I'm a shopaholic. I had my first real job at the age of 20, and armed with a payslip and certificate of employment, I applied for my first ever credit card and was approved. I had more pre-approved cards after that. After laying my hands on them, throwing caution to the wind, I swiped to my hearts content! And that was the start of my love-hate relationship to all things shopping-with-a-credit card related. After that it became a habit. When our combined salary is not enough to pay those expenses, instead of cutting down on the spending, I swipe. I never bothered to look at our budget, always thinking that I could use my credit card to buy and pay for things. Every payday, I buy new clothes and stuff for me, hubby and the baby and some things for the house. Until one time, the card was declined while I was then buying formula milk and I had no cash with me! The reality of it all sunk in. Instead of paying for the card bill when its due, I would almost always just pay for the minimum amount, thinking I would pay it next time in full anyway. And of course, eventually the amount piled up. It got so bad that I can't open credit card bills anymore for fear of heart attack! My salary was just used for paying those credit card bills and we had no savings at all. That time of my life was a nightmare! Now, I am a shopaholic no more. I only have one credit card, used only in extreme emergencies. I am still paying for some of those cards and I have learned my lesson the hard way. Now with 3 kids and a mortgage, I think a thousand times before buying stuff. I haven't even bought a Digicam even on zero-interest card installment plans! This is my shopaholic confession and I hope you learn from my story. I am excited to watch the movie and I am sure I can definitely relate. Catch Confessions of a Shopaholic in Cinemas on February 18, 2009! A love letter, a poem, a card, a CD or a drawing or anything made by my loved ones top my list as this shows their effort and thoughtfulness. I would really, really love a scrap book that would show how much they love me! Who wouldn't want to get flowers? Need not be the expensive, over-the top bouquet. Just one (or three or a dozen, he he) white rose from the husband will do it for me. Or from the kiddos, the neighbor's Gumamela or Santan pickings will do just fine. It will definitely warm my heart! To give me that warm fuzzy feeling, I could do with a pack of Flat Tops or Chocnut or Cloud Nine as these are comfort food for me. A warm cup of chocolate drink will also do the trick. A book by my favorite author and I don't mind second hand books! One of my favorite haunts are book sales so my husband knows that I don't care much for brand new (except for new releases like Twilight!) as long as its in readable condition. A dish cooked for me. For a change, I want to eat something I didn't prepare. If its my favorite dish then its an even bigger treat. A picnic or a movie marathon. 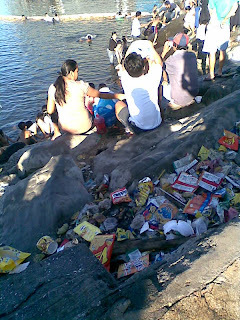 I want a picnic at the QC Memorial Circle. Much better if not organized by me. If its a DVD marathon of my favorite movies (Star Wars, Godfather, Star Trek, Harry Potter), best served with popcorn cooked by husband. A plant or cute gardening tools. I love gardening and when I have time, I plant flowers in the tiny patch I call a garden. A potted flowering plant will just be adorable. A small hand trowel or pruning shears will be perfect. I am not sure if they are expensive though. There are other Valentine's gift ideas out there that are inexpensive and will truly be appreciated by your loved ones. You just have to flex your creative muscles a little! 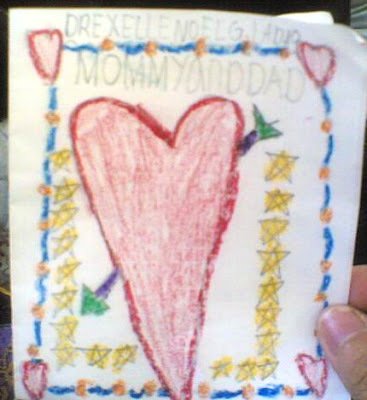 But the best Valentine's gift for me will always be my family's love and affection! And Valentine's, just like Christmas is not the only day for giving gifts and showing love. Make it a habit to say I love You to your husband and kids. Advance Happy Valentine's Day to All! 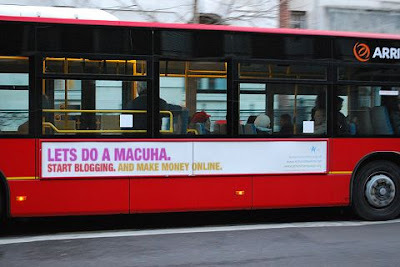 This is a cool advertising venue for well, atheists in the UK. I got this from macuha.com and thought I would make my own in his honor. You can make your own here. Cebu Pacific is again opening summer travel with fares as low as P188-all in! Seats from Manila to Busuanga, Cebu, Iloilo, Legaspi, Naga and San Jose Mindoro are for P188 all in only, while its P288, P488, P688 and P1,188 for other domestic destinations. Travel period is from February 4 to March 31 so hurry and book now because the sale is until February 10 only or until the allotted seats are sold. Manila to Boracay tickets are at P488-all in but good luck on finding available seats. Better choose Tuesdays to Thursday to travel to get better-priced seats. Of course this seat sale is nothing compared to their crazy Zero Fare promo last year where I only paid P2,000 for round trip tickets to Bohol for 5 passengers. But still this seat sale gives you best value for your money, so book now! What the hell are these for? I'm just asking. 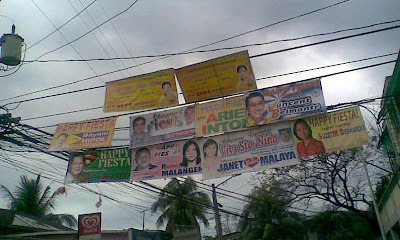 I can't understand why our local government officials feel that they need to greet us Happy Holidays, Happy Graduation and Happy Fiesta and other inane Happy Whatever, as pictured from a street near our house. These are eyesores I tell you and serve no other purpose than to annoy you in thinking why you need to pay for your taxes when they will just use it to print these things. The election is a year away and we can expect this to get worst. But I think this one is more irritating than most. This is a HAPPY VALENTINES greeting!!! Forgive the quality of the photo, I was so pissed while I was taking this. I'm just asking here, do we have a law that prohibits this kind of of things? Recently in the news is the random drug testing proposed by the government to curb prevalent use of prohibited drugs even by young high school students. Unfortunately, despite the identification of drug users who can be saved with proper rehabilitation, we do not have facilities that offer treatments for addiction to alcohol, prescription drugs, cocaine, heroin and other banned substances. I wish we have enough facilities, both public and private for heroin detox and other related treatments so that this fight against illegal drugs is not for naught. Drug rehabilitation is not a joke, and every individual who once fell vittim to it deserves another chance. This policy is valid from 05 February 2009. This blog is a personal blog written and edited by me. For questions about this blog, please contact ishi0506atgmaildotcom. The owner of this blog is compensated to provide opinion on products, services, websites and various other topics. Even though the owner of this blog receives compensation for posts or advertisements, we always give our honest opinions, findings, beliefs, or experiences on those topics or products. The views and opinions expressed on this blog are purely the bloggers' own. Any product claim, statistic, quote or other representation about a product or service should be verified with the manufacturer, provider or party in question. Nagsimba kami kahapon sa simbahan ng Sta. 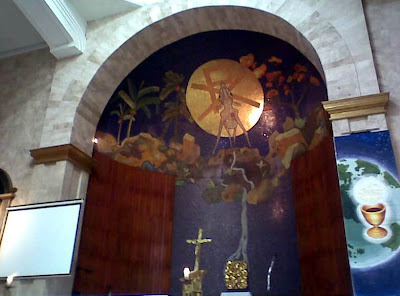 Cruz sa Maynila para sa aking kaarawan at napansin ko ang altar na kulay lila. Naisip ko na isali sa linggong ito ang aking kuhang litrato. 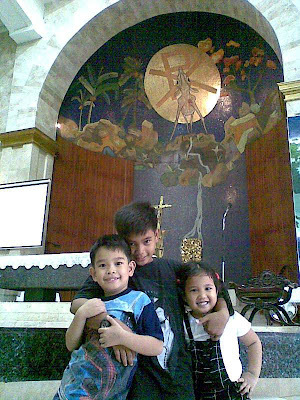 Naisip ko na isali na rin ang larawan ng aking mga anak na nagpapa-cute para kunan ko rin sila ng litrato habang ako ay humahanap ng magandang angulo ng altar. Marami pang ibang magagandang lahok dito.